Just a minor note for the observant---I'm reprinting and reposting the ARIMA sector reports since March 12. I was using ggplot2 as my graphics package (in R), which changed the way it formatted dates in a recent upgrade. Since March, this meant the ARIMA forecast plots had the date format "2012-03-12" rather than simply listing full months by name, such as "March." Past data was rerun, so everything else is identical, but the format of the date axis has been updated to the original, monthly format for purely aesthetic reasons. I spent the weekend playing with R's mapping capabilties. For most purposes, I think you can accomplish more writing raw SVG wrapped in a flash interface to allow easy web interactivity like what we did for CAFf. However, there are some applications for which a good static cloropleth map can be very useful---like when you want quick situational awareness of important numbers that change at slow frequency. 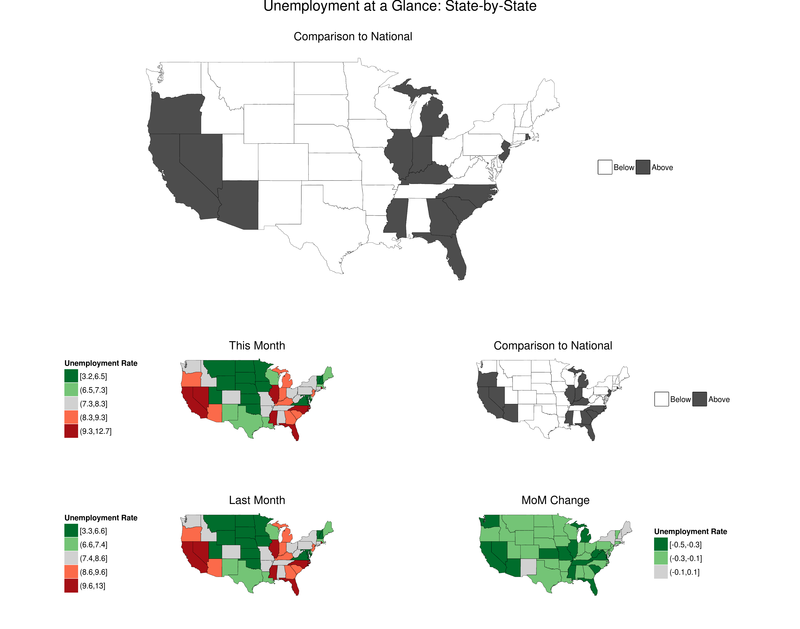 Following up on the first report series launched, the Arima Sector Forecast Reports, I'm going to add a regular GIS report to provide an at-a-glance view of US unemployment. On the topic of Generativity and Creativity: entrepreneurials doing impulsive, crazy things and their stories making that leap. Take a look at the full event write-up on Ribbonfarm. I intend to speak there about a design philosophy---and how it impacts my approach to numbers, art, and risk. The event is fully booked, but I'm sure Venkat will post an excellent summary. This is a repost from the R-bloggers mailing list, with a quick script showing credit rating on a global map. It displays sovereign credit ratings by S&P, Fitch, Moody's, and Chinese rating firm, Dagong, and demonstrates how easy it's become to create beautiful data visualizations. The sector forecasts will be down for maintenance tomorrow, Thursday, December 15. However, for historical purposes, the Thursday forecast will be posted afterwards on Friday, December 16.